Premium EDM Vol. 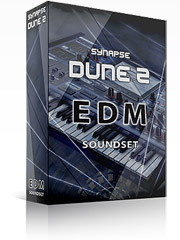 1 is our first soundset for the DUNE 2 software synthesizer. After several months of hard work, this soundset contains a collection of 64 only highest quality and inspirational patches for electronic dance music, ready for your next hit! Get your hands on the freshest and the most impressive House/Electro soundbank ever! All patches support the modulation wheel, and most patches respond to aftertouch and Velocity as well, for maximum flexibility.